Update: November went completely sideways. Dental issues and health issues monopolized the month! I will have to try again another time. Perhaps NaNoWriMo will have to take place for me in January. 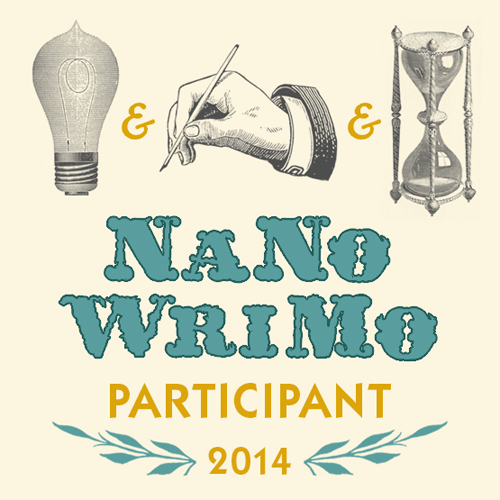 I've signed up for NaNoWriMo this year! For those of you wondering, that stands for National Novel Writing Month and it has been a recurring event since 1999. I've joined in the past but abandoned it early on in the process. This year I feel as though I need to work my brain in different ways and thought this just might be the way to do it. A dear friend of mine, Sarah, is also writing this month so I have a real, live buddy in this crazy project. I have no clue whether I will finish the whole 50,000 words or not, but it will be good exercise for the old grey matter anyway! I don't even feel as though I have a specific story to tell just yet, but there are a few little thoughts meandering around in my head that may join forces to create something bigger. Time will tell! Off to make a cup of herbal tea and hope that inspiration strikes! You don ' t have to be crazy but it helps! Today is the first day of NaNoWriMo 2007. I have been following this site for a few years now and have contemplated participating several times but never quite got up the nerve. This year I decided to give it a go. I think I may have completely lost it! We are hoping to move to our new house in the very near future, I have 2 little people to chase after, and a to do list a mile long but I'm really feeling the need to do something somewhat creative. This involves no cost, no time consuming set up or take down every day, no safety risk to the kids or to me, and allows me the chance to let my imagination run wild without having to worry about someone grading my work. I don't know if I'll actually make it or not but it's worth a shot! For those of you who are wondering, NaNoWriMo stands for National Novel Writing Month (say NAN-no WRY-mo)and it is a self-induced contest with one's self (and others if you choose) to see if you can write a novel in the month of November. To qualify you must have written 50,000 words at the end of the 30 days. The novel is never read or judged by anyone on the site, you simply submit your document to a verifying word counter on the site. There is no official prize. I honestly don't have a plot so I am just winging it. I don't know what the finished product will look like. It will probably never be reread by me or by anyone else. I by no means consider myself to be anything resembling a writer, it's just something new for me to try.